Find My Workspace lists over 95% of the executive office suites market in Kearny. Simply click Request Quote to check pricing for one office, or Add to Basket for multiple offices. Over 40,000 square feet of fully modernized and newly renovated prime office/creative/flex space situated on a historic WWII shipyard. Ideal for light manufacturing, tech and other creative businesses. Spaces available at $14/SF. The spaces range in size from 400 SF to more than 8,000 SF. Flexible lease terms and scalable units are designed to meet your needs. Plus, worry-free amenities help you focus on what you do best while this centre handle the rest. This space features a host of amenities including expansive flexible floor plans, state-of-the-art roving security with 24/7 electronic access, plug-and-play high-speed Internet (Wired Certified Platinum), free on-site parking, high 13-ft. ceilings and on-site building management for all tenants. Floor loads can support up to 350 lbs. 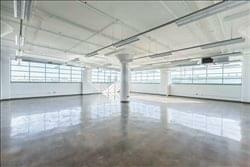 per square foot making it ideal for light manufacturing and maker tenants. This centre is also an Energy Star certified green building featuring all new elevators, windows, HVAC and LED lighting.